European Fan Palm (aka Mediterranean Fan Palm) is the only palm native to Europe, and is hardier than most palms. Give it the warm, sunny days and cool nights of its native dry mountain habitat and you'll find that it's easy to grow. This shruby palm will eventually reach about 4 ft (1.2 m) tall indoors. As the plant matures, the trunk develops numerous sharp spines. Fine-textured fronds grow in a rounded fan of 10-20 leaflets that reach up to 24 in/60 cm wide. The leaflets range in color from silvery green to blue-green and naturally split as they mature. Repot only when needed. European fan palm has fragile roots, so repot only every 3 years or so. They grow deep -- so keep this palm in a deep pot. Once the plant reaches the size you want, you can top-dress it instead by replacing the top couple inches of potting mix. Take care not to disturb any roots that may be near the surface. Watering tip: Palms are sensitive to chlorine, fluoride, and other chemicals often found in tap water, as well as the salt in softened water. Use only distilled or filtered water to avoid the build-up of chemicals. Although slow-growing, it is well worth the wait because even small plants will stand out, making it a stunning sculptural accent for the home. This fan palm tree is also long-lived, so you'll enjoy it for many years. This European palm looks similar to some other fan palms that aren't as easy to please indoors. 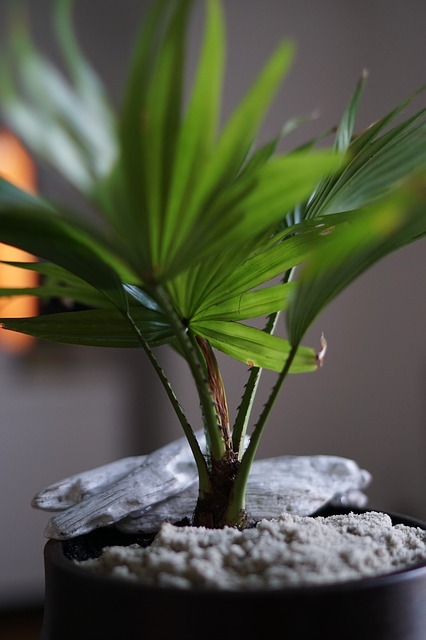 Look for the Chamaerops humilis botanical name to be sure you're getting this palm. Light: Needs at least 4 hours of direct sun a day. Give the pot a quarter-turn every week to expose each side to sunlight. Water: Keep constantly moist in spring and summer. In fall and winter, allow top 2 in (5 cm) of soil to dry out between waterings. When watering, avoid getting the base of the palm wet to prevent rot. Use a container with drainage holes, and fast-draining potting mix to prevent soggy soil. Humidity: Average room humidity (around 40% relative humidity). If air is dry in winter, use a cool-mist room humidifier like this one. Soil: Mix 2 parts peat moss-based potting mix and 1 part sharp sand. Repot only when necessary, about every 3 years. Fertilizer: Feed monthly spring and summer with a balanced liquid fertilizer diluted by half. Do not feed in fall and winter. Propagation: Sow seeds in spring, barely covering the seeds with soil. Keep them warm (75-80°F/24-27°C) and moist. Palm seeds can take several weeks to germinate, so be patient. 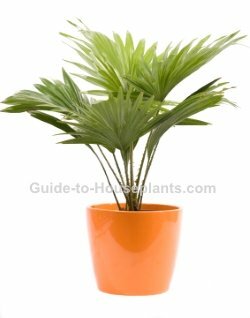 European palm is one of the few palms that readily produces suckers that can be cut away and potted in their own containers.